I have been wearing the Targee II's for a number of years now. They are probably my all time favorite shoe. My first pair lasted a good awhile but eventually split a the toe seem. I bought a new pair and with very little use other than an out to dinner, once in a while kind deal, the toe area split on the new pair. I contacted Keen and let them know that I exected nothing on the first pair. I really didn't even expect much on the new pair other than maybe a little pro-rated help on a replacement third pair (sent detailed pictures also). The second pair was worn so sparingly but was older than one year and the factory refused any help in any way. 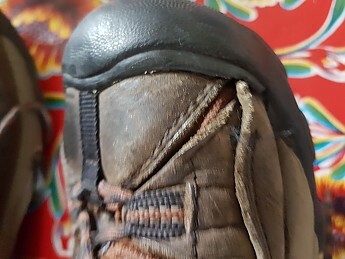 I have never had the problem with any other shoe or boot that I have ever worn of any type and you can see in both pair that the material overlap was extremely minimal to hold the joint together. I like the shoe so much that I brought a third pair and only wear them at times where my dogs want to enjoy themselves and keep watch over the seam. I have seen a similar failure on a Targhee II in Vermont where I actually stopped the person and asked about them. The Targhee II in my opinion is a great shoe but the customer service aspect of the manufacture was nonexistent in my case. Soles started falling to pieces after only a month or so. This is my second pair of Targhee IIs. My first pair were worn most days for 2-3 years, including much wilderness hiking as well as city walking. I ended up replacing them when the wear on the heal became obvious—they were great. The new pair are at the other end of the spectrum as far as quality. It seems that the glue used to hold the layers of the sole together was substandard. Part of the tread started peeling away after only a few weeks and now it looks like a whole layer will fall off soon. It's been less than a year. Too bad about your new Targhees not holding up, Martin. If you have some pictures to show how they've come apart, those would be helpful to see in your review. I've really wanted to love these shoes...but just can't. I've owned a pair of these boots for about four years now, and I've really wanted to love them, but I just can't. 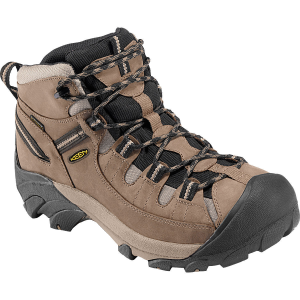 I tried on a pair of the Targhee II Mid boots size 11 in a store, and really like the fit and comfort, especially the wide toebox. But, I wanted the low shoe version and the store didn't have any. So, I ordered the low shoe version online, size 11. However, when they arrived they just weren't as comfortable. First, the heel cup was too wide, so I had to lace them tight to keep my foot from sliding forward in the shoe. I normally lace my shoes up pretty tight to begin with, but I had to tighten these even more. To the point that the laces started digging into the top of my feet and were very uncomfortable. I checked and confirmed that they were the medium width, so it wasn't the wrong width shoe. So, I thought perhaps I just ordered the wrong size for these. I sent them back and got a size 10.5 instead. The heel cup was a bit smaller in this size, but still a bit more spacious than I preferred. I did have to lace them up pretty tight, but by wearing a pair of medium weight wool socks, I didn't have to lace them up quite as much. So the laces weren't digging across my feet anymore. However, now they were slightly too short that my toes pressed up against the front of the shoe slightly. Not to the point that I felt I needed to return them, but made them slightly less comfortable. 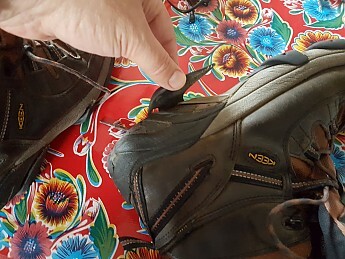 In the end, I kept the 10.5 size shoe and have traded between the Targhee II and a pair of Merrells when heading out for a hike or backpacking trip. The Targhee II have proven to be very durable, and even though they are a low shoe, they still provide my feet with enough support to handle multi-day backpacking trips with 40-70 pounds of gear on my back. They don't offer much in terms of ankle support, but they aren't intended to. But the footbed has been more then adequate for my use. Additionally, the toe bumper is a nice feature that has protected my toes from numerous rock strikes. I've been able to test the waterproof-ness and have had no issues with water entering the shoe. However, this feature also makes the shoe much warmer than it would normally be. Usually not an issue for me, but it could be for others. They have held up quite nicely over the years. I don't wear them too regularly, maybe 30-40 days a year, but they pretty much still look brand new, even after multiple backpacking trips of 20+ miles. Would I buy the low version of the Targhee II's again? Probably not. I've tried the Targhee II Mid a couple of times in stores to see if the pair I originally tried on was an anomaly, but every pair I've tried has felt super comfortable, and I plan on picking up a pair of the Mid the next time I feel I need a new pair of hiking/backpacking boots. 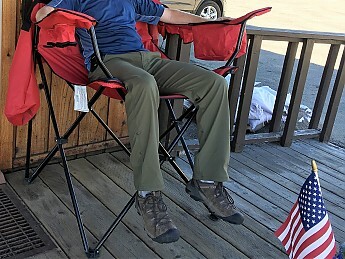 Enjoying a sit in an oversized campchair in Stanley, ID, while wearing the Keen Targhee II. Nice review, mackaym, thanks! Too bad about the fit issues though. 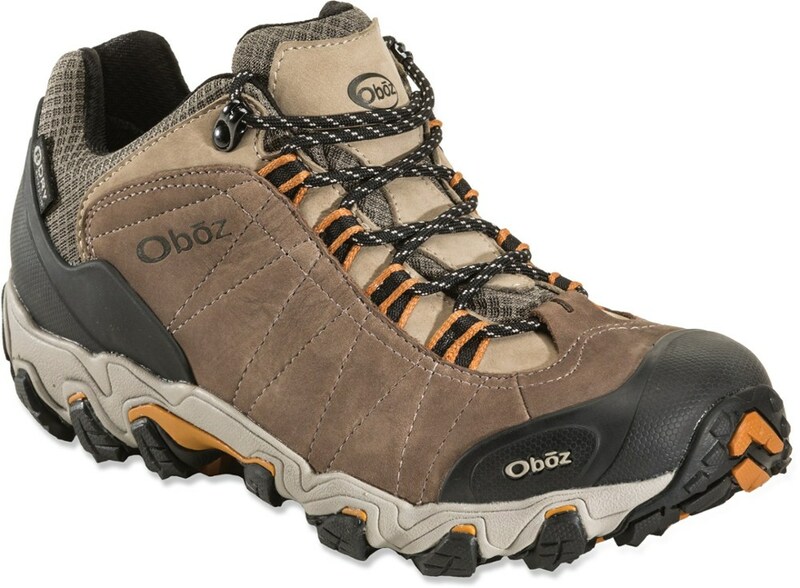 These are great shoes for hiking and really protect your feet if you are hiking in rocky terrain. They breathe well, and dry quickly. The soles grip the ground well, even on rocky slopes. I've been hiking in these shoes for over a year and I've really liked them. There's virtually no break-in time. They never gave me blisters and are comfortable even after big miles. The laces are a little short so if you use custom lacing methods, purchase longer ones. I do find that really fine gravel sometimes finds its way in and needs to be emptied which is a little annoying. 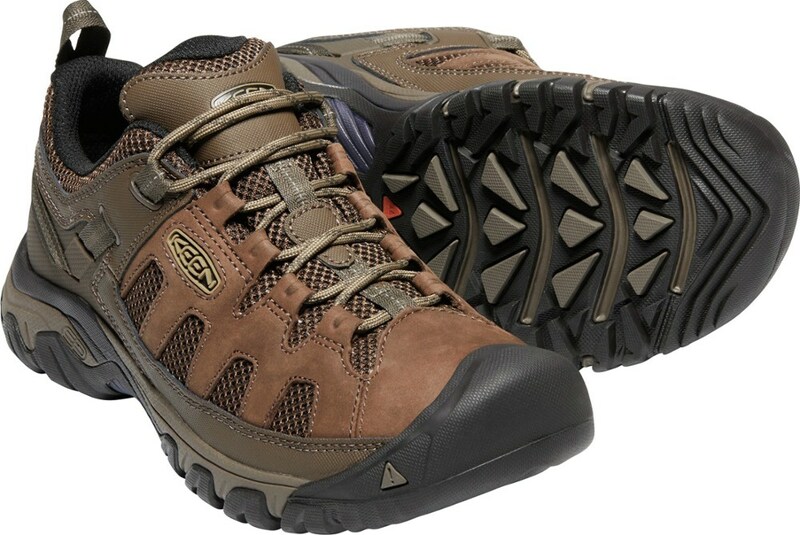 This is a low cut trail shoe, so if you are an easy ankle roller, perhaps the Targhee II Mids would be better for you. My ankles are usually pretty stable, so these have worked well for me. The sole goes up a ways on the sides, which helps keep water out. They are relatively water resistant when walking through small puddles or mud, but expect to get wet feet if you miss-step in a stream crossing. They do dry pretty quickly, though. My favorite part is the toe protection — it is really great when you're worn out at the end of a hike and keep kicking rocks. The soles are very grippy and are very stable even on steep slopes. I have been using them for over a year, and they have held up very well. They are well constructed and feel very durable. Even in chillier weather, they work pretty well. I've used them in light snow with a good pair of wool socks. Obviously they won't protect you from deeper snow, as they don't go up past the ankles. To sum it up they are waterproof. They are light on the feet. The heal is well cushioned and supportive. And most importantly they are comfortable. I have had my pair for 2.5 years now and they have held strong. When I buy shoes I assess how the heal is when I walk, for I walk sort of like a penguin, in that my feet are very angled when I walk. As a result the heals of some shoes feel awkward, so when trying these they passed the test. I live in Southern California, in the mountains, so I use them in the mountains. 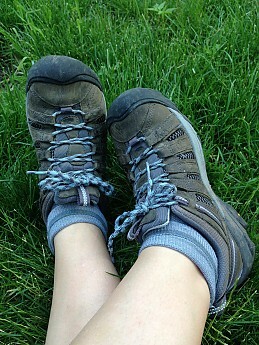 I love backpacking, but I hate boots, so I will more than gladly pull the laces tight on my Keens and hit the trail. The heal is very well cushioned, and feel much better than any other shoe I have owned, so a 50-, 60-, 70-lb pack won't bother your heals (no guarantee on the back though). They are also extremely light, yet strong, and provide excellent traction. Though I must admit that after several years of abuse I have worn the traction down, but I haven't tossed them because they are still holding up (thus they are strong). Since I do live in Southern California, the waterproofness hasn't been as big of an need as it would be in my native Washington, but I do live in the mountains, and so come winter they have been great, as they don't get soaked through while traipsing through the snow. As for fit, they fit great. I am a size 9 and the 9 was perfect. The comfort has been great, with no need of breaking in. And I never get blisters (the other reason I prefer them while backpacking). I will note that after several years of use and abuse the first thing to go was the water resistance. I would complain more, but I live in Southern Cal, and they are holding together. The traction, which is awesome, will decline with use. 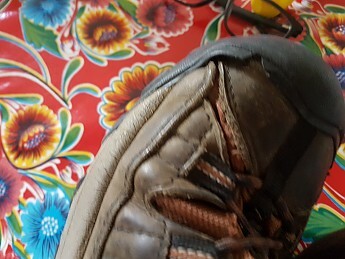 I feel the sole is of a softer rubber, which provides greater grip, but with two years of lots of use will show the wear, and currently I have little/no tread left. But because of the rubber, it does continue to provide decent traction on many surfaces. It is only over the last six months that the shoe has started to come apart at the seems, but it is only a little outer dehiscence (for you medical folk), and the inner lining has held strong, so I am still out there going strong. For the price, which is really competitive, you get an awesome shoe. I wore the Targhee IIs in the winter as a street shoe and as my hiking shoe in non-sandal weather when there wasn't snow on the ground. I love the way they fit and the waterproofing is excellent. The worst thing about shoes is the plastic both sides of sole at the midfoot. Step on a wet log on the midfoot (which is your natural balance point) and your foot shoots out from under you. If you are not very coordinated or lucky, you will fall. 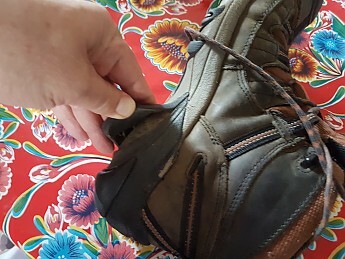 My Targhee II's split after about 5 years. I like the way the look and love the way they fit. Due to the plastic on the soles, I will not be purchasing new ones. I am replacing them with Keen's Siskiyou WP shoes. They aren't leather so they don't lend themselves to casual dress like the Targhee II's, but they don't have plastic on the soles. For what it's worth, I wrote Keen about the problem with plastic on the bottom of hiking shoes and they never responded. First time fit is a bit snug, however my feet do run wide. But after you wear them for a bit you get them broken in and they are great. Dry Dry Dry Dry Dry, I've yet to have water get into these, although I haven't hiked on many trails with stream crossings in them, but in the rain they are leak proof. Grip is great, had no problem on some rock scrambles and even a little bouldering action. Use: short dayhikes, rought trail dayhikes with daypack, anything up to 8 miles. Overall this has been a very comfortable shoe. I have used them on a variety of trails and terrain. From sand trails to rugged rock slides. They grip really well and once broken in are very comfortable. The downside that I am most upset about this shoe is how long they are lasting. Either I am very tough on my shoes or the rubber soles on these things are cheap. I bought them last April 08 and they are almost completely wore out. And I am not hiking every day here. I have had other hiking shoes hold up longer. The rest of the shoe is fine, but the rest of it is wearing out like someone doing burnouts with offroad tires if you know what I mean. On second note, it's worth getting the Gore-tex model, I opted for cheap 20$ less for the non and every time I step in a puddle I regret it. Overall, this Keen shoe is great. I use them for day hikes and for general, casual use. I would not plan on using these shoes for backpacking due to the low ankle support. The shoes were tight during the break-in period (about 8 miles). After that, they are very comfortable. Why 4 stars? I'm not married to the look of the shoe, but due to the comfort, I am getting over this minor issue. Great overall day hike shoe, with a light pack. I have an EE wide foot and usually go 1/2 size up to accommodate my wide foot with a medium or heavy merino sock. Exactly what I did with this shoe, and it's still a bit big. Very durable. And I've abused them. Waterproof in light trail water. I love these shoes. It's like they're made for my Flintstone feet. My go-to shoes for 15 miles or less hikes. Thanks for the review, Kerry. 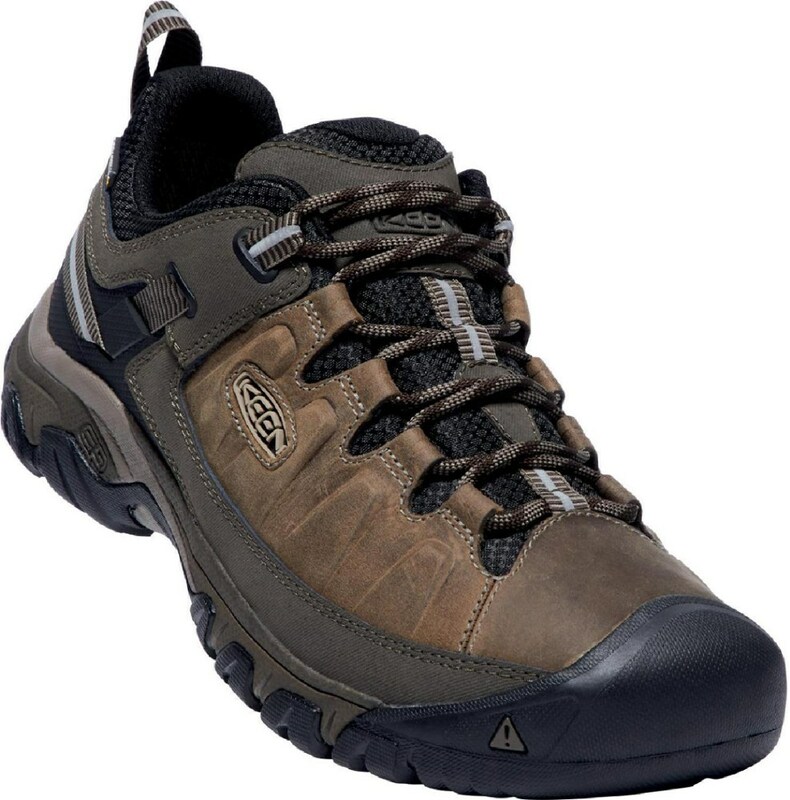 Good looking hiking shoe that is great for every day, but my ankle was killed on my last hike. I had been shopping for a new pair of hiking shoes and decided on this pair about two months ago. I usually wear an 8 1/2 and sometimes 9, but ended up with the 8 1/2. I was about to buy them at REI, but they were out of stock and ended up getting them on Amazon. I wore them around all day for a week in town, long walks, and easy hikes to break them in. I really do not believe that they really needed to be broken in, but you never know. These have been totally comfy, but with a little heel slip. After I adjusted the laces, I had much less of a problem with that. I also added my sock liners when I went for the hikes. I didn't take these though any streams or lakes, but they held up really well in mud and in rain. They were pretty easy to clean off as well. I felt that these shoes had some good grip as well. By the end of my hikes I was happy to get these off and cool off my feet, as they kept my feet pretty warm. I do really like these shoes, but will probably not take them on a more intense hike around here. I may end up with the boot style of the Targhees. Sorry to hear about the ankle. I hope it gets better quickly. Thanks for sharing your recent reviews, Samantha. I hope the ankle mends quickly. Thank you! So far so good. But not being able to hike?!?!? It's like an itch I can't scratch! The Vibram sole adds stability and comfort on long hikes. Feet felt good after 20 miles. The Vibram sole adds stability and comfort. Made for a medium width foot. If you have a narrow foot, these shoes are not for you. I purchased the shoes for an off-road half marathon. I purchased the shoes for an off-road half marathon. They are definitely not suited to this kind of activity. The shoes are unyielding, and my feet were sore for more than a week after the event. Be prepared to wear thick socks with undersole cushioning. Rigid and unyielding with very poor cushioning. The tongue appears too narrow, causing ridges that dig into the top of the feet. 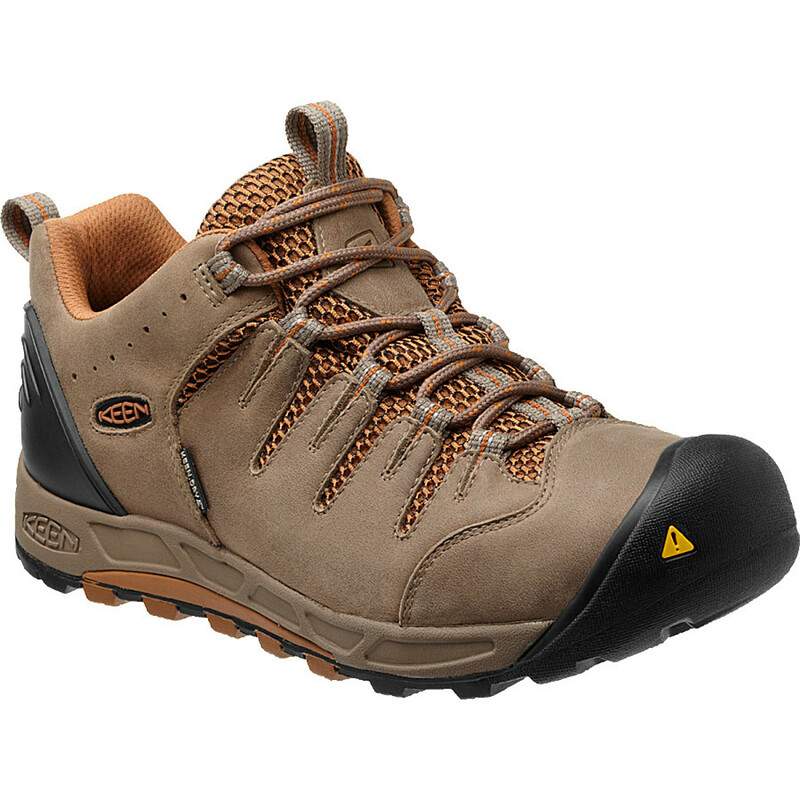 I was sold the Targhee II as a lightweight hiking shoe, suitable for off-road events. The shoes are a good fit, which is important as I have a wide (4E) foot. As I have low ankle bones, I frequently have problems with shoes pressing on my ankles, but this was not an issue with the Targhee II. The lacing system is good, and the laces hold their grip well. The shoes are waterproof, and the soles provide good grip in mud, on slippery clay, and on wet leaves. I feel that I made a mistake in choosing to wear the shoes new for an off-road half marathon event, however I have subsequently found them still uncomfortable to wear, even as a casual 'knock-around' shoe. There is minimal or no cushioning in the insole, and the shoes feel rigid to wear. More than a week after the event I tried the shoes on again, meaning to wear them as casual shoes, but my feet were still too sore to wear the Targhees due to their lack of cushioning. I have since worn them, once, and continue to find them uncomfortable to wear. In addition to the discomfort caused by the lack of cushioning, the design of the tongue causes the webbing joining the tongue to the body of the upper to create ridges that dig into the top of my foot. Great fit out of the box. Wide toe box. Good traction. Great fit out of the box. Wide toe box. Good traction. I use this shoe for hiking rough mountainous trails. I would recommend this hiking shoe for anyone and especially if you have a wide foot. Needs an insert for better heel fit. I am on my fourth pair of this shoe. It always fits great right out of the box with no break-in needed. I get no chaffing at all. Inserts wear fast so I put a better insert in after about 50 miles. I get about 375 to 425 miles out of each pair. Support is good in the sole and arch. it is a low shoe so there is no ankle support. It is waterproof and does well crossing streams. I use an old pair for fishing shoes. I trust the traction both uphill and down hill. They grip rocks great. Shoe laces work good for adjustments needed. Outside tread came loose on one of my pairs and had to glue it back on. I hike 80 to 110 miles per month in rugged desert mountains. I will use this shoe as long as they keep making them. I have been extremely satisfied with them. I highly recommend this shoe. Poor fit, disappointing quality from Keen. Great customer service, though. I bought a pair of theses at my local outfitter and in the store they seemed to fit pretty good. I am a big Keen fan and have looked at these for some time before finally deciding to pull the trigger right after Thanksgiving 2012. Once I got them home and started wearing them I realized there was a problem getting them to fit properly. The tongue would bunch up under the laces and would not allow me to tighten properly. If I tried to make the tongue lay correctly it would create pressure points on top of my feet. They also had a very loose fit and did not feel very stable on the trail. My local outfitter would not take them back because they had been worn but did offer to exchange for a different size. The problem was the 8 1/2 was too small (I bought a 9 which is my usual size). They suggested I contact Keen. Keen's customer service is awesome! I emailed them and explained the problem and was directed to fill out an online warranty form (the shoes were only a month old). After a couple of weeks, I received an email from Keen with a credit for the full price ($120) of the Targhees to be used towards an online purchase. Fantastic! I was disappointed because I really liked the Targhees and wanted them to work, but I was also very pleased because what I really wanted was a new pair of Keens. After a lot of research and reading online reviews, I chose a pair of Gypsum boots as the replacement. That turned out to be a great choice and I will submit a separate review for them. Bottom line, I just could not get the Targhees to fit me, they were unwearable. If they work for you, then I think they are a great shoe. 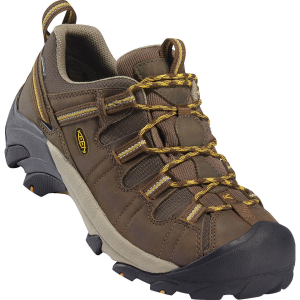 The Keen Targhee II is a low cut hiking shoe. It is waterproof and breathable. I find it to be very sturdy and comfortable, both in the woods and in town. The lacing ends with the laces going through a strap that goes to the top of the heel on both sides. I assume the purpose of this is to lock the heel down and prevent it from moving side to side. The sole of the shoe is very sturdy and provides comfort on rocks, sticks and roots. The toe box is quite large and provides a very comfortable fit. I really like the fit. I find the shoe to be very comfortable and sturdy. Very sturdy shank, enhancing the comfort. I really like this shoe. I bought them when I was at my heaviest (250 lbs) and was having all kinds of lower leg and foot problems. I have been very impressed with the waterproofing on this shoe. I have yet to have any kind of water enter the shoe through the membrane. I also find the breathability to be second to none. This is one of the shoe's best features — you can wear them day after day and they don't get funky. Breaking them in required daily use for me and I did feel some discomfort in the sides of the heel where the straps between the heel and the lacing passes through the stitching. This mechanism produced a bump inside the heel area on both sides that irritated my foot. I bought Superfeet when I bought these shoes, but found that the arch support and insole in the shoe itself was more than adequate. These shoes, in fact, became the only shoe I wore as my feet and ankles rehabilitated themselves as I dropped from 250 down to 225. The only issue I have with the show is the traction. Wearing them at work, I have to be extremely careful walking across a newly mopped floor or wet concrete. And though I wear them all time on walks through the woods, I am very uncomfortable climbing mountains with them. In fact, the first time I wore them hiking, I climbed Streaked Mountain in Buckfield, Maine, at the tail end of a rain shower. Streaked is sheet rock from about half way. Though I got to the top okay, as I was shooting video with my phone at the summit, I slipped on the rock and smashed my phone on the ground. Coming down was extremely dicey, with my feet slipping out from under me a couple of times. I really like these shoes, as I have said before. However, in terms of using them for what I bought them for, mountain climbing, they are unusable. The lack of confidence they inspire prevent me from wearing them in the mountains. This is disappointing at the price point of $120. If you are looking for around town shoes and money isn't the issue it is to me, these are great shoes. Personally, I am going back to my worn out L.L. Bean $59 hikers. I have an issue with the seam on the heal between the fabric and the waterproof membrane. It is a cause of friction not due to poor fit and as a result blisters are a big problem on longer walks. Despite many different methods of socks/liner socks, taping, lacing techniques and Superfeet Green inserts I haven't been able to overcome this issue. Part of this problem is due to my left foot being slightly smaller than my right, and as such these problems are greater on my left heel. Overall, I find the Keen Targhee 2 shoes to be a very comfortable fit, but I recommend an intensive in-store evaluation before you commit to purchasing them. I would also strongly recommend the boot instead of the shoe for any hiking situation for better waterproofing and ankle support on uneven terrain. This experience hasn't swayed me from keen, I've recently purchased some Newport H2 sandals and I love them. I bought these shoes to replace another pair on my PCT Oregon segment hike. Within the first week I had a nasty blister on my heel and under both front toes. After 300 miles the stitching at the toe came loose on both shoes. The soles did not offer enough cushioning on the lava. I couldn't wait to get these shoes off at night. The waterproofing wore off when it came time to ford streams and rivers. I contacted Keen when I returned. 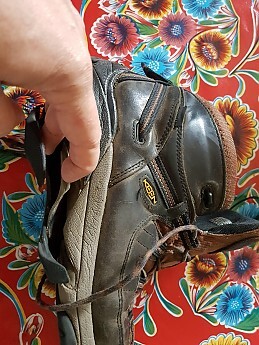 My recourse is to return the shoes where I bought them (very inconvenient since I bought them in Ashland and I live in Eastern Oregon) or get a replacement of another Keen footwear product from the company. Unfortunately, I don't see anything that's comparable in price that I want. This is an amazing hiking shoe! I was nervous to hike very far in these just because they are low-tops, but they're awesome! I hiked Mt. Whitney in them, with a 22lb. pack - did 21 miles in a day without blisters! I did try wearing them backpacking, but the weight of the pack was too much for these shoes. The most amazing thing is that the Targhee 11's do not need any breaking in time; they fit great from day one! I wear them to hike in 3-4 days a week (purchased them a year ago), and they're still going strong. Thank you Keen! The wide toebox is perfect for my foot, and the arch support is very comfortable. I wore these boots around town for several days to be sure they were broken in, but they didn't really need any breaking in at all because they fit great. My first day hiking in them consisted of two short hikes; I wore them with Smartwool socks and had no blisters, I also walked through some mud and puddles and my feet didn't get wet. I couldn't wait to get them off, however, because my feet were getting pretty warm. The second day hike was quite a bit longer and over much rockier terrain. I felt like Spiderman on the rocks! I didn't slip at all and the only problem was that the downhill return trip was a little tough on my toes. I do, however, have knee problems and wasn't walking well anyway. Near the end of the hike we were caught in a hard rainstorm and were soaked completely through, except my socks weren't totally wet. My only problem with these boots is that the ankle support comes up to an awkward height for me and digs into my Achilles tendon a little while walking down steep hills. It did prevent me from twisting my ankle twice, though. All in all, these boots were definitely worth the price based on my first couple of hikes in them. I have hiked several times in these boots and I refuse to do it anymore; I've moved into hiking in either Teva Aravallis or sandals. I hiked the AT on an overnight trail and my feet got so beat to hell in these boots that I lost the big toenail on my left foot and damaged my big toenail on my right foot, as well as the second toes on both my feet. This is, of course, partially my fault for not using hiking poles and wearing socks that were too thick because the weather was cold. However, I don't find there to be enough cushion in these boots to do anything but wear them around town. Also, I wore them in the rain today and my socks were a bit damp after a 30 minute downpour, so use an extra sealant if you're going to be in wet weather. I ended up returning these after about one month of use. I purchased 1/2 size larger based on the recommendation of the EMS saleman. I guess Keens run small. The shoe was very tight and uncomfortable. The soles are stiff and never really broke in. I also didn't like arch support.